First up, Il Posto, run by the charming Andrea Frizzi from Milano (who kissed my on both cheeks to thank me as I left). The amuse bouche here is a tiny shot glass of Lambrusco, a sparkling rose sort of wine from Italy, and the gesture sets the tone for the food and service. Although we started with burrata, draped in thinly sliced prosciutto and garnished with basil leaves, we ate that so quickly I never snapped a shot. Andrea imports it from Italy, and it’s as good as I remember it in Puglia. 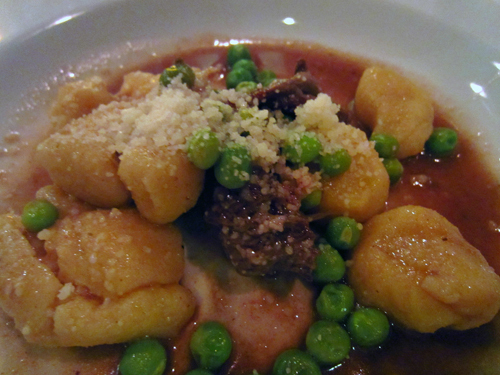 My primi course was this springy gnocchi dish with peas and some pieces of braised beef. Light as a feather and delicious. 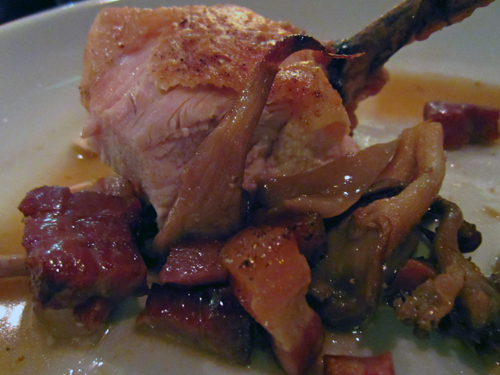 Next up, the most tender roast chicken I’ve had in ages, served with a wide variety of sauteed mushrooms and large crispy pieces of pancetta. 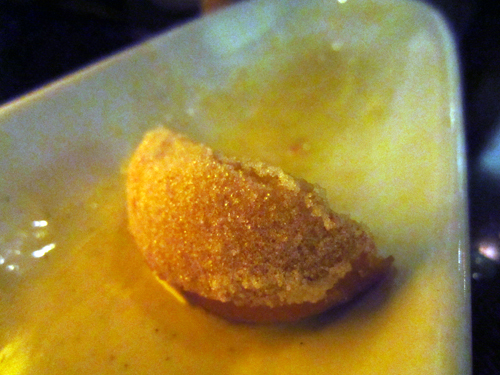 Our table shared an order of the bombolini for dessert – this little beignet type of dough, fried and served with a buttery vanilla sauce. Again, we ate that so quickly I only managed to snap the final piece before someone speared it. Next up, Cholon. 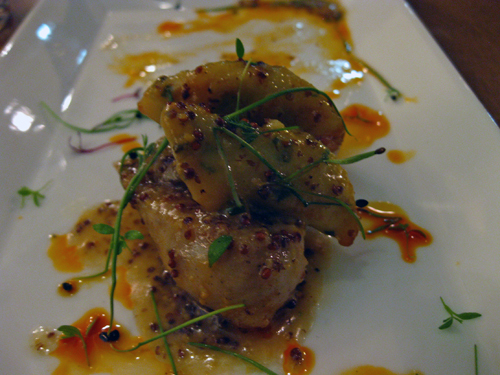 Advertised as a modern Asian bistro, it’s the most inventive Asian cuisine I’ve had possibly ever. 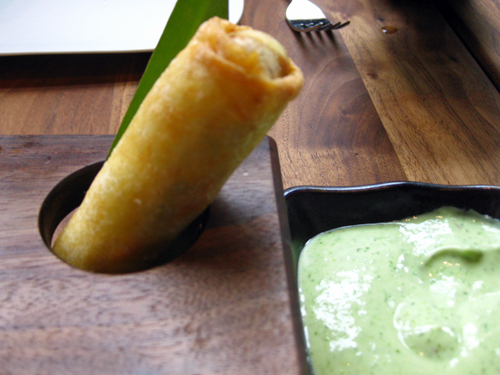 These duck spring rolls served with an Asian twist on an aioli dipping sauce are a perfect example. Although this is a kind of ugly shot of the soup, I wanted you to see how they present it. 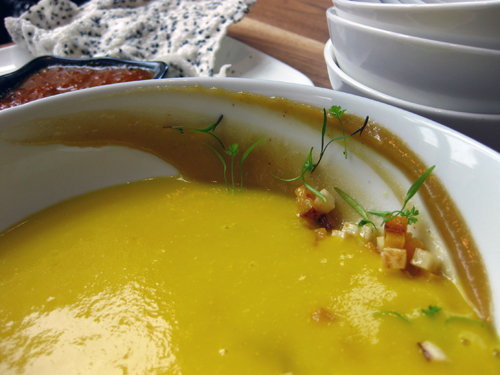 The bowl comes painted with pureed apple, little pieces of apple, herbs and seasonings, then the soup is poured in tableside for you to mix and enjoy. Fabulous! And how is this for creative? 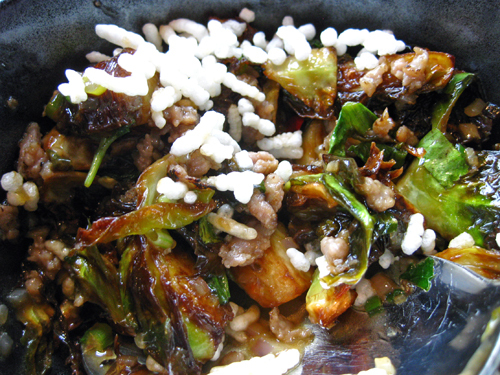 Caramelized Brussels sprouts with ground pork and mint. Sounds weird, tastes out of this world. And finally, Bittersweet, where Olav Peterson has created a farm in the city out of an abandoned gas station and serves up creative, seasonal, artisinal cuisine. We were on the winter menu when we were there, so started with in house made sausages. My entree (poorly photographed, sorry!) 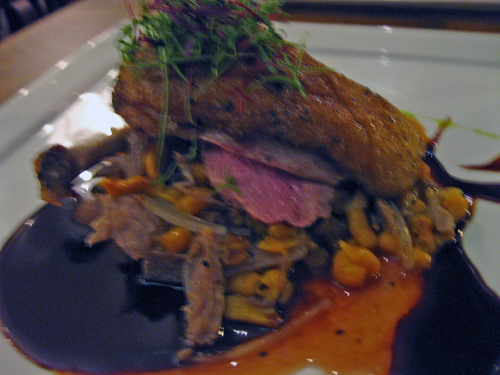 was a succulent duck breast served over sweet potato spaetzle with caramelized onions. Because you’ve asked, I’m going to try to be more timely in posting the restaurants where I eat so you can pick a new place to try! Buon appetito! ok…these are going to the top of my “must try” list. I’ve never been to any of them and they all sound fabulous. Thanks for the recommendations.